I’m creaking up Victoria Hill on the peak tram — it used to be the longest funicular in the British Empire. Serious commuters look nowhere as they are angled out of the confusion and into the sky. Tourists are all eyes. From the top I look down through the buildings on fork-tailed kites. Hong Kong is hills with infrastructure — a honeycombed tribute to something as yet undefined. Above the facejambing streets: straddling neon and rusty air-conditioners jutting from the windows of a million skyborn flats. Some buildings are wrapped in bamboo and plastic as if they’ve been bad. Somewhere below: sirens. Up here a woman sits at an easel and paints cats in oil. Her gilt-framed canvasses are spread around, priced in pounds, dollars, and yen. They’re realistic, often back-lit, fresh and sensitive, with a western touch. “I am to take commission,” says a small, discreet sign. All the cats are distinct. As far as I can see they are true to breed: Tabby, Manx, Persian, Siamese, Marmalade. They all have personality. I can visualize tourists taking sentimental photos out of their purses and getting the woman to do them while they dine. She’s good. She knows her cats. There’s not a dog in sight. Two days later after a short train ride we’re in a restaurant with a portrait of a cat outside. It’s noodles and Chinese cabbage in a steaming bowl. It’s big round-tables and the din of noisy families. Waiters keep passing by with plates of mystery. A man at the next table is escorted outside by one of the waiters. Through the screen I see him in front of a pile of cages. He’s making a choice. A white one. The waiter takes the nonprotesting cat to the kitchen. There is too much noise to hear any noise. In half an hour, as we’re leaving, the waiter brings cat to his table. The leaves of the tree in the foyer are covered with dust. I wet my finger and put an “X” on one of the leaves. Esoterica: If you ever need ideas on painting cats, try this: Cats — Drawing and Painting in Watercolour by Lesley Fotherby. It has color plates and how-to drawings. Another valuable book is The Painted Cat: The Cat in Western Painting from the Fifteenth to the Twentieth Century, by Elizabeth Foucart-Walter and Pierre Rosenberg. The following are selected responses to the above letter. Thank you for writing. As my cat parades across the monitor and finally settles in my lap I am nearly sick after your letter. The first part was very visual, but you could have left the last one out. I know other cultures have different preferences, but I cannot see what that section had to do with art! Perhaps to shock!!! Shame on you. I have a cat who is my best animal friend. I enjoy reading your e-mails but didn’t need to know about the cats that the Chinese eat. It makes me feel bad. I would rather hear about people or sights you are visiting. You have been to a place we will never go. Just because you saw something disgusting, don’t share it with us… I love animals and there is a lot of animal suffering in the world. In this time of sorrow in the US and the world, spare us the gore, give us something to enlighten us and to boost our spirits. Your letters are taking a downward and depressing spiral lately. If they continue, I will have to eliminate you from my world. Everyday life can be depressing enough. You must be kidding. Chinese do not eat cats in Hong Kong. Some of them eat dogs, but they have to go to China though. All kinds of pets are protected by laws in Hong Kong. I have not seen one restaurant kill pets for food in 40 years of my life in Hong Kong. Keep the bull shits in your mouth, please. You have misled the public. And do not mix up China with Hong Kong. They were separated by 5 minutes of ride by train. (RG note) My apologies for this error. I have changed the letter so it will not mislead. The restaurant was indeed not in Hong Kong but nearby in China. When I read about the cat being chosen for the meal I thought about my trips to the grocery store where I walk by and never fail to look and feel sympathy for the crabs and lobsters in the tank waiting to be chosen. That was my first reaction to your letter, but when I let that vision leave my head what I read into your letter was this… Whether it be a cat… a landscape… a still life… what ever the subject or experience is …each and every person views… feels… and interprets what they are experiencing differently and they are all valid in their world but that does not mean somebody else is going to accept… agree or participate in that world. I generally understand the levels and sensitivity of thought that go into your letters. But the marking of the “X” on the leaf stumped me this time. (RG note) My marking of an “X” on the leaf was my inadequate response to a cultural gap. I did not make myself too clear in the letter. I was not checking off the life of another defenseless animal, nor was I ‘X-rating’ the restaurant. The situation of cats, dogs, wildlife and denizens of zoos in parts of Asia is well documented by foundations and is readily available on the internet. I packed up my car and headed south, about 1600 miles to Key West, stopping in a few places, armed with my trusty Olympus and a Fuji. I took a few photographs in Virginia, North and South Carolina, Georgia, and Florida. What started out to be a project of photographing women working… quickly evolved into something much larger. After two weeks on the road and a few hundred photos, I arrived in Key West, happy, excited to reach my destination. Hemingway’s home. When I arrived at the entrance, I was greeted by “Doris Day” a big yellow tabby. 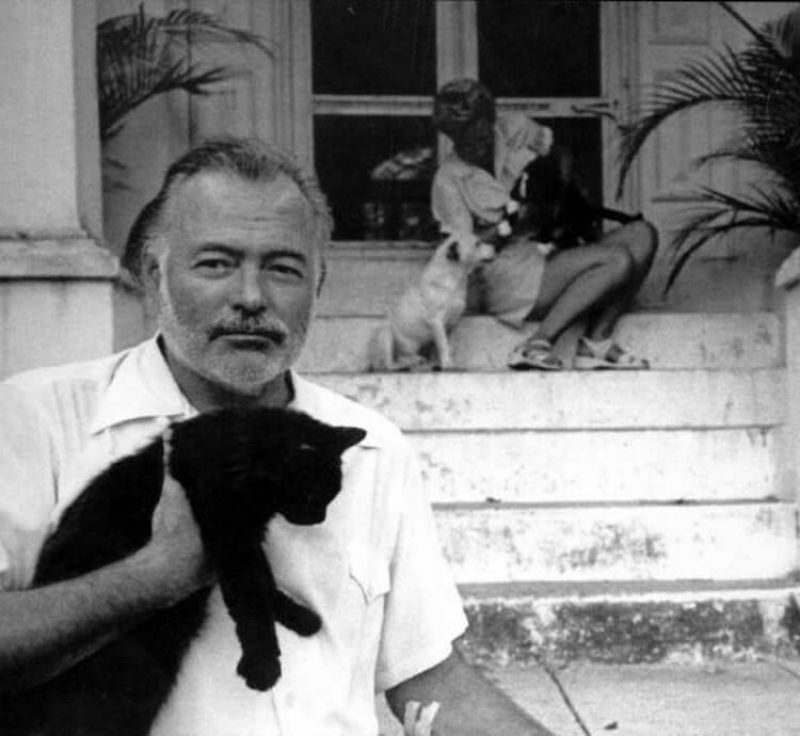 I was fascinated by Hemingway’s cats, sixty-four of them. All lazing around the grounds, under trees on patios and porches, all six and seven toed cats (the next generation). I spent the entire first day photographing and writing poetry and enjoyed the sun and the sights. The next day I met “Jimmy Stewart, Clark Gable, Marilyn Monroe, Eva Gardner (a calico, my favorite), James Dean, Greta Garbo, and Zane Gray.” These cats were easy to photograph in this haven for felines. On several of the garden paths there were stainless steel bowls with dry cat food and water, though it seemed to me that a few of the cats enjoyed drinking from a converted urinal from a bar that Hemingway had brought home one night. It was a simple trough of cement, inlaid with Mexican tiles, and decorated with a great Italian urn which Hemingway’s wife had purchased for embellishment. I watched, from Hemingway’s studio stairs as “Clark Gable” climbed upon the edge to quench his thirst. Later, among cats, I sat in a garden spot to take in the scenery and write some poetry. It was a wonderful “cat-tastic” adventure. In ancient Egypt the cat was considered a sacred animal. In Slavic and European folklore cat was considered the essence with magic supersensitivity. In modern national medicine are appreciated therapeutic abilities of the cats to help to the people with cardiovascular and different nervous diseases. It is, because the cats feel movement of microcurrents on nervous trunks of the man. The generation of microcurrents and, accordingly, power microwaves from the cats also helps such patients. By the way, textile art works developed and created with electrodynamical possibilities are useful for this reason too (speaking about our hand woven tapestries). Of course, the many of artists are people with hypersensivity and these are able to feel biomicrovaves, and from cats including. Many, but not all. This autumn we have spent almost week to find our little clever kitten. It was cold, I stood at the entrance of the underground with table, on which was written in Russian “Was lost the kitten.” It is necessary to note that Moscow is a Russia in a miniature. There are more than 160 nationalities in the Russian Federation. Many people stand and trade informally near an entrance of the underground. Naturally, some of them spoke: “The cat? Abnormal man!” About me, of course. I responded them: “We have the different mentality” I should add, that in Russia and in Ukraine not only are not eating any cats and dogs, but, nobody eats any frogs and oysters. Somebody can say we are abnormal people? Just, we have different mentality. The cat was a symbol of liberty in Roman times. “Libertas,” the goddess of liberty, was often sculpted with a cat at her feet. Cats have been with us for 40 million years, they may be here after we’ve gone. Apart from the companionship that cats provide, they are one of mankind’s most useful pets. While valuable as subjects for art, East Asia would do well to liberate and encourage more of its cats in the business of controlling their rats and mice which are a problem. You may be interested to know that artists from every state in the USA, every province in Canada, and at least 95 countries worldwide have visited these pages since January 1, 2001.